How To Clean Faux Suede Shoes? How do you take care of a pair of faux suede shoes? Learning how to clean faux suede shoes allows them to last longer. Proper cleaning and maintenance also allow them to look as if they’re brand new, even if it’s been years since you’ve bought them. If you’re deciding whether or not you should invest on a good pair of new, faux suede shoes, there are things that you should know. What is faux suede in the first place? How does it compare to genuine suede? How do you take care of a pair of faux suede shoes? How do you clean them? Is Faux Suede any Good? There are several differences between faux and real suede. For one, real suede offers higher durability than faux suede. However, many faux suede manufacturers nowadays often make good-quality synthetic suede that can match the durability of the real deal. The real deal is also at least twice as expensive as its synthetic counterpart. Genuine suede also comes from animal hides like goat, sheep, dear and other animals, so they’re not exactly animal-friendly. That is where most people draw the line. Faux suede is much easier to clean and care for, because genuine suede and water for cleaning don’t mix. Genuine suede also has a really strong, leathery smell. This, paired with the fact that it’s much more difficult to clean, is the main reason that most people stay away from genuine suede, especially for use in couches. The first thing you need to do is check the labels. Different faux suede manufacturers may suggest different ways to care for your shoes, and the best thing to do is to follow them. Care labels may not be present on all shoe boxes though. In that case, just go on and assume the general care guide for suede, and start with the second step. The second step is to brush your faux suede shoes and get rid of dried dirt and grime. Use a soft brush to get rid of them. There are specialized brushes for faux suede, and any shoe-cleaning supplies store can sell you one. You don’t need to buy one though as you can use any old, soft toothbrush. After you get rid of superficial dirt, the next step is to slightly wet your brush with a bit of warm water. Faux suede can absorb its fair share of dirt and grime because of the fabric. If not immediately cleaned, dirt, grime, salt and mud will dry and embed themselves deeper within the fabric. 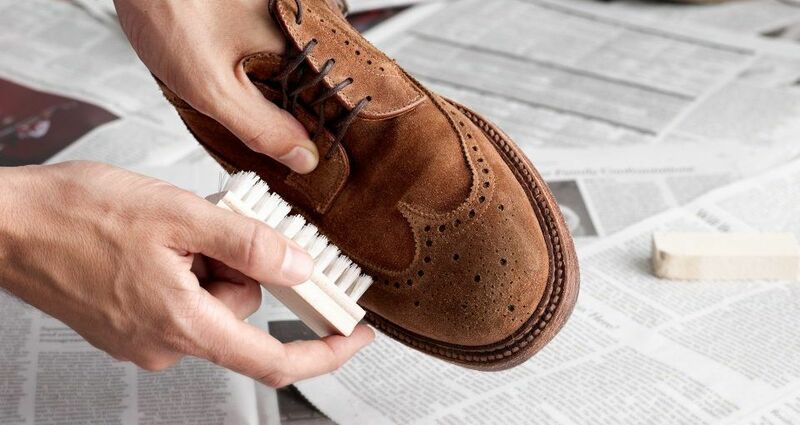 Brush your shoes with small circular motions. Then, pat the spots you brushed with a dry and clean lint-free cloth. For other types of stains, use a cleaning solution. You can buy a synthetic suede cleaning solution, but you can make your own as well. Homemade solutions are usually made with just mild soap and water. Dip a clean, lint-free cloth into the cleaning solution, and try the solution on a small, less noticeable part of your shoe to test if the fabric can handle the cleaning. If the fabric’s dye doesn’t fade in 5 to 10 minutes, continue the cleaning by gently rubbing the cloth at the stained spot. Then, again, pat the spots you rubbed with a dry and clean lint-free cloth. Some people recommend alcohol and water because they dry much easier. But be careful: some suede fabrics lose their color when cleaned with alcohol. When mild soap doesn’t cut it, try using a dishwashing soap instead. You can make a cleaning solution that is more effective against oil-based stains when you use a dishwashing soap. After you’re done cleaning with the solution, leave your shoes to air-dry. This shouldn’t take longer than 30 minutes if you’ve properly dried using the lint-free cloth or rag. Then, use a clean, dry brush again and brush all over your shoes. This raises the nap, or brings the surface of the faux suede fabric up, to make them look brand new again. How do you protect fake suede? Prevention is better than cure, and the same applies to faux suede shoes. You need to learn how to take care of your shoes, because proper faux suede shoes maintenance can help them last longer. If you don’t have the time to clean your fake suede shoes weekly, it might be a good idea to invest on a water-repellant and stain-repellant spray. These kinds of sprays are silicon-based. The silicon binds with the fake suede fabric to protect them from water and stains. It’s also a good idea to test your waterproofing sprays before you spray them all over your shoes. Different suede fabrics react differently to waterproofing sprays. To test if they’re compatible, spray a little bit of waterproofing solution on a clean, lint-free cloth or rag. Then lightly pat the cloth on a small area on the back of the shoe. Wait for a few minutes, and see if the fake suede fabric fades or looks strange. If it does, the spray isn’t compatible. Ask around for recommendations on effective, compatible waterproofing sprays. Faux suede shoes aren’t as expensive as genuine suede shoes, but you should take care of them nonetheless. Lots of people want to learn how to clean faux suede shoes so they can last longer. The good news is that they can be very easy to clean. You only need a brush, a lint-free cloth and a good cleaning solution and you’re ready to go. You don’t need to spend a dime if you don’t want to, and still get your fake suede shoes looking like they’re brand new. 5. How To Clean The Inside Shoes?